The Difference Between Vampires and Angels...MY Take! Linda had been with the Family for less than two months when she participated in the deaths of seven human beings. Manson had had over two years to threaten and pressure me. I say, Susan, you're just a slow-learner, Man; but you came around and killed eventually anyway, Good on ya Sue! Linda had two parents, separated, and an ex-husband she could have escaped to (and eventually did). I had no one in the world to turn to. I say, You had brothers and a Father and even if they didn't want ya, there's a little thing called a Police Station you could have gone to in L.A. to seek help in terms of safety and shelter. But then, I guess you'd have to be a normal kid instead of the blood thirsty young adult you were, huh? Linda claimed she participated because of fears for her four-year-old daughter. I had a ten-month-old, two-month premature son to fear for. I say, Yep, you REALLY cared for that son of yours, that when you were caught up in that raid, the people who took charge of your baby found that he was suffering from mal-nutrition, yep, that's love! And I'm POSITIVE you were thinking of that baby's welfare when you squatted in that fetid slum of Spahn's and had your baby "plop" out with out any medical attention paid to it at all. Your "love" for this kid knew no bounds, huh Sadie? Linda had sharpened the knives at Spahn’s Ranch, I hadn’t. I say, then by YOUR definition, Danny deCarlo, the Family's weapons-man, was more guilty than Tex or Charlie, of pulling the trigger on that .22 Buntline, on Lottsapoppa, Jay and Voytek? Hmmmmm...fascinating logic! Linda had carried a knife that night, just as I had. I say, and that gets YOU off the hook HOW exactly? And YOU, Sadie, would know Linda carried a knife to Tate that night, why, cause YOU asked for hers when you lost yours! Yep, that's putting an angelic face on ya Sadie! Linda had driven the car on both crime nights. I had not. I say, Linda had a valid driver's licence and YOU did NOT! What makes you so sure you wouldn't have been the driver if you had had a valid license? Linda stood watch outside the Cielo House. I had not. I say, Yeah! 'Cause you were too busy slicing up people to be the lookout, duffus! Linda ran away from the crime scene at the Cielo House. I had frozen and had not been able to participate. Linda discarded the weapons and clothing after the Cielo crime. I had not. I say, weren't you and Katie just too "exhausted" (I think that's the word YOU used) to do anything more than the killing. Oh, you poor baby! It's a good thing you had help after the slaughter from that evil-doer Linda! 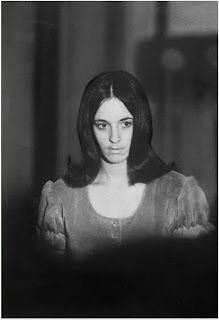 After the Cielo crime, when Manson asked all of us if we had any remorse Linda claimed she didn’t – just as I had. I say, what, technically, had Linda needed to be remorseful for, except being back-up for YOUR horrific acts of brutality? Linda had gone out the next night fearing what would happen, just as I had. I say, Just like you "feared" what would happen when you went to Gary's on the 25th? Didn't stop ya going from Gary's, did it; so why would it stop you from going on the 10th? Linda had driven Manson to the LaBiancas’ home, I hadn’t. I say, AGAIN with the valid driver's licence, Batman! By YOUR reasoning, your get-out-of-jail-free card is all hinged on YOU not having one...tell that to a judge deary and see how far it gets ya! Linda stayed in the car at the LaBianca crime scene, just as I had. I say, soooo, lemme see if I get this straight...YOU were NOT guilty of driving, nor of staying in the car BUT Linda was? Are you smokin' dope right now Sadie while you're writing this, or what? Linda accepted Ms. LaBianca’s stolen wallet from Manson. I hadn’t. I say, what was she supposed to do when Charlie handed it to her? Let it drop on the car floor boards like some hot potato? Throw it back into his face? Bunt it with her wrists like a volleyball? What exactly at that point would have been the "innocent" thing to do with Rosemary's wallet, Sadie? I didn't hear where you let out a terrifying scream at the sight of it, grab it from Charlie, say to him, "That's Wrong!" and proceed back up the drive to redeposit that wallet into Rosemary's purse, or did I miss that testimony? Linda had deposited Ms. LaBianca’s wallet at a gas station to mislead police. I hadn’t. Linda stopped the car so Manson could attempt to kill another motorist. I hadn’t. I say, And isn't it YOU who keep harping in this book of the controlling power Charlie had on Family members? Like what, if you'd been driving, you would have hit the throttle as soon as Charlie's feet hit the ground? Or did YOU yell to Linda, "Don't stop!" and we all missed that testimony too? Linda told Manson where another victim might be found the night of the LaBianca crime. I had not. I say, YOU said in this book you knew no one other than The Family in L.A., so how could you have offered up a name? 'Cause I'm fairly certain with your love of attention-getting, you would have if you'd known one, right? Linda showed Manson where the other potential victim lived. I had not. I say, how could you show Manson where someone lived if YOU knew of no one beyond The Family members? Linda had friends; you did NOT. Linda was friendly; YOU were creepy! Linda didn’t go to the police even after she got her daughter back. I agreed to testify even though I never got my son back. I say, Yeah, that's called "Saving your skin" Sadie. You sliced into people's skin; Linda did NOT. Seems like you needed a deal a wee bit more than Linda, huh? I say, And the fact that she hadn't even swung a knife at another human being was not a factor, I guess. Like YOU would have willingly pounded on any cop shop's door had you traded places with Linda. Oh, yeah, and there's that tiny detail that YOU had blood on your hands and Linda did not...sure you would have gone to the cops, sure Sadie, I believe ya! Linda only offered to make a deal with the District Attorney’s Office after she’d been indicted. I had agreed to work with the police as soon as they asked me. I say, YOU were in jail; Linda was not. YOU had killed people; Linda had not. YOU knew the jig was up; Linda didn't even know about that Barker raid/arrests to know that the jig was up and there may be a need for her to make a deal; YOU DID! Are ya following me here Sadie? Are ya? Linda agreed to testified against Manson on condition she be given absolute immunity. I had agreed to testify against Manson and still go to trial for my part in the crime. I say, So she had a smart lawyer and your lawyer was as brain-dead as his client...sour grapes...hmmmmm? Linda hadn’t been the one to break the case to the police. I was. I say, Yep, you're right. You were the Official Family Jailhouse snitch, the broad who always needed to be the centre of attention even if that meant spilling the beans to get it. I'd give ya a gold star for being a First Class idiot, if I could. Linda hadn’t been the one who got Charles Manson indicted. I was. I say, Yep Sadie, your powers of snitching went far and wide and I guess that is what happens when you have blood on your hands - and you KNOW it - and you'll say anything to save your behind, huh? Linda didn’t go out with the police to try to find evidence. I did. I say, Centre of Attention Syndrome, no doubt, my dear. that, and I guess you would know where the bloody knives, gun and clothes fell, you were one of the killers, correct? Mr. Bugliosi claims Linda told him she still loved Manson even after watching him orchestrate the murder of seven people, even during the trial. I never claimed that. I say, All that means is she's capable of love and YOU, the sociopath that you are, never were. Well, that's the long and short of it. It must be difficult being a sociopath and having to spend all your time and energy focused on how YOU were the victim in all this. It must be exhausting. Well, thanks to the good people at the Board of Paroles, you have allllllll the time in the world to ruminate. Have atter Sadie! Can't wait for your next excuse, I mean book! I don't get it. They get out of the death penalty and then they try and sue the warden of the prison as holding them as political prisoners. We have to go through this every five or so years, right? I notice that Katie or Leslie didn't write a book. Maybe they came to grips with the fact that they are never gonna be free. Cripes. I should be so lucky.